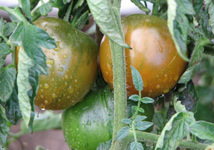 The 5-ounce Black Prince tomato is one of the most popular black heirloom tomato varieties next to the Black Krim. It is regarded as a true northern variety having its roots in Irkutsk, Siberia, and has excellent growing qualities for cooler climates. In fact it is widely grown commercially in Russia today. The 2-1/2 inch diameter fruit ripens to a beautiful deep garnet red with some dark brown. The inside of the fruit is also dark red to brown. The fruits are smooth and round, medium sized, and very juicy. The Black Prince has a sweet and rich flavor that makes it regularly score well in taste tests. Its indeterminate vines are productive and not excessive in growth. It should be harvested when its upper half has turned dark but still shows traces of green. 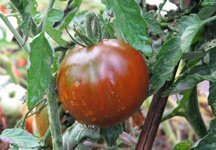 I recommend buying Black Prince tomato seeds at TomatoFest because they specialize in heirloom tomatoes and their seeds are certified organic.